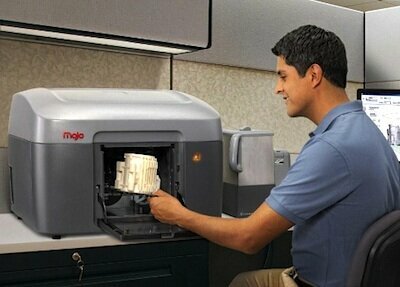 Stratasys announces it’s got Mojo: First professional 3D printer under $10,000! Last week we pointed out the intriguing countdown timer on the Stratasys website. They said, “Something’s Coming. The magic begins on May 8. Check back to see what’s new in the world of 3D printing.” Yesterday, we made a guess that it’s a new line of multi-color 3D printers. We were wrong. Today, the countdown went to zero, and the mystery was cleared up. I can’t say it’s “magic,” but it is amazing to see a professional grade 3D printer under $10,000 USD. This is clearly a huge step towards putting a professional grade 3D printer on the desk of every engineer. The most noticeable aspect of the Mojo is ease of use. Stratasys has vastly simplified several key user interaction points, both in hardware and software. Swapping filament is done by lifting a cartridge (now called a “Print Engine”) into one of two chambers in the machine. Attaching filament is massively easier in the Mojo, since the Print Engine now includes the print head right on the end of the filament. You need only insert the print head into the extruder assembly and you’re done. No mess, no filament cutting, no need to mush out leftover filament – the entire filament path is now part of the Print Engine. They’ve been able to manage this by ingeniously locating the extruder assembly above the heated build chamber so it isn’t subject to massive heating and cooling. Empty print engines, which include the extruder motor, are recyclable through Stratasys. Software is simplified. The Mojo is controlled by a USB-attached dedicated PC, through which networked users can access the machine. The user interface is also simplified and includes a “Wizard” with easy-to-comprehend graphics that illustrate operator decisions as well as simplifying job control for multiple copies: If you specify more copies than can fit on a build tray, it automatically sets up a new job for you! Stratasys/Objet seem to be firmly committed to the professional and commercial end of the 3D printing world. As a stockholder in the company, I’m very pleased with this focus. MINNEAPOLIS–(BUSINESS WIRE)– There’s Mojo in the making at Stratasys (Nasdaq:SSYS) today, as the company announced its latest effort: the Mojo 3D Printer, which comes in a complete system called a 3D Print Pack. The Mojo 3D Print Pack is the market’s lowest-priced professional-grade complete 3D printing system. In this keynote video, Stratasys Global Marketing VP Jon Cobb introduced the revolutionary Mojo to an enthused audience at the company’s international reseller meeting. Priced at $9,900, the Mojo 3D Print Pack is more than just the printer. The package contains everything needed to produce models (including material and a support-removal system). Like all 3D printers from Stratasys, Mojo is a genuine, patented Fused Deposition Modeling (FDM®) system. In the U.S., Stratasys offers a leasing option with payments as low as $185 per month. To produce a model, Mojo employs an innovative variation on traditional FDM material extrusion. The ABS material spool and the print head are integrated to a single package, called the QuickPack print engine. To ensure optimal reliability, a fresh print head is part of each material change. Material loading is similar to snapping in an inkjet cartridge on a paper printer. A desktop 3D printer, Mojo measures only 25 inches wide and 21 inches deep. It measures 18 inches in height (64 x 53 x 46 cm). As with a paper printer, no training is needed to get it set up and running, and settings are selected at the host computer, not the printer itself. Modeling operations are easy with Mojo’s preprocessing software, Print Wizard, which helps users efficiently manage workflow. Support material removal is also a simple process with the included WaveWash55. It is a self-contained, hands-free cleaning system, and it requires no plumbing. Delivering fine feature detail, Mojo has a layer resolution previously available only in the Dimension Elite and the Fortus Production 3D Printer line.